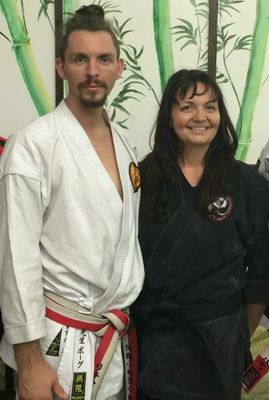 Richard Poage and Tiffany Richards together co-owned Peaceful Warrior Martial Arts and they made a huge difference in the lives of their students. Richard was the lead instructor. Richard had trained in martial arts since he was only four years old. He trained under Okinawan Grand Masters; Taika Oyata, Naonobu Ahagon and Shugoro Nakazato. Richard trained in Shorin-Ryu Shorinkan karate under Shugoro Nakazato and his immediate Sensei, Kyoshi Eddie Bethea. Richard held a fifth degree Black Belt in Shorin-Ryu karate and a third degree in kobudo. Richard also held varying degrees of Black Belts in Shuri-Ryu, Shorei-Ryu and Ryukyu Kempo. Richard Poage began his training in 1989 under the number two kickboxer in the world, Dino Holmesy. In 1992 he began training Okinawa Karate. During this time he also studied shoot boxing and grappling with UFC coach, Richard Hamilton, in addition to Brazilian Jui-Jitsu. At age 14, Richard was the youngest student to receive Black Belt from Taika Oyata in Ryukyu Kenpo. In 2001, he began his study of Shorin-Ryu and traditional Japanese Jujitsu. Richard Poage traveled to Okinawa to train in the birthplace of karate in order to consistently improve his art and teaching skills. He had been a full-time dojo owner and karate instructor since 2002. Richard taught more than 10,000 martial arts classes during his lifetime. Richard Poage began competing in 1990 and was an avid competitor. He has won several Grand Championships in kumite, kobudo and kata. Richard won more than 1,000 awards including National and World titles. He held #1 Instructor in Arizona five-years running. At age 25, he was appointed to the U.S. Team to fight at the Pan Am Games. He taught seminars around the country including Arizona, California and Washington DC, to name just a few. Richard Poage passed away on on December 27, 2017 at 2:04am PST from complications from brain surgery to remove a tumor. He was only 32 years old. A Celebration of life for Richard Poage was held on January 20, 2017 at Chaparral Christian Church in Scottsdale AZ and after the celebration family and friends met to eat Richards favorite foods with plenty of Orion and sake and shred their memories of Richard. In lieu of flowers please consider donating to the Richard M. Poage Okinawan Karate Scholarship Fund. 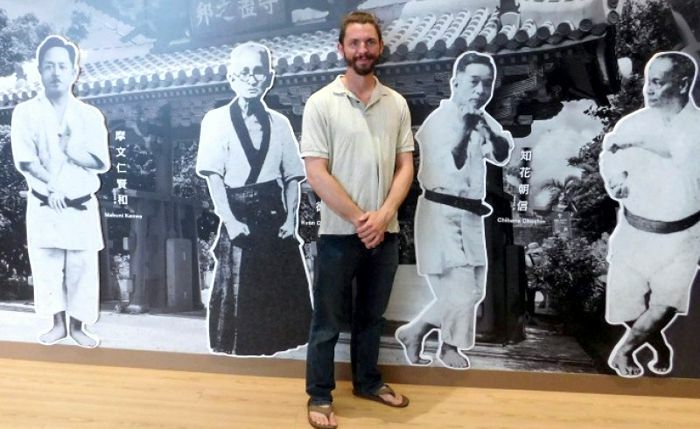 This fund is intended to carry on Sensei Poage’s legacy of teaching and spreading Okinawan karate by sending qualifying students to the birthplace of karate to experience the culture, and train with masters there. He thought it was important for karateka to get that experience, and he would love to have the ability to send students to Okinawa, so we feel this is a fitting tribute to his memory.